The municipality of Prince Edward County is leaning towards opting in to allow a retail cannabis storefront in the community. A meeting with the committee of the whole of county council was held at the Prince Edward Community Centre on Jan. 9. The purpose of the meeting was to discuss the committee’s stance on how they will deal with the upcoming vote on Jan. 22, to decide whether or not they want to opt in to have cannabis stores within their jurisdiction. There were a range of opinions and views expressed about the issue at the meeting. The stores will be regulated by the Alcohol and Gaming Commission of Ontario and will have strict guidelines about their proximity to school buildings, times of operation and products sold. Some people say they believe the government is moving too fast and forcing municipalities to make decisions without enough information. With cannabis just recently becoming legalized, there are no examples of successful and safe storefronts for municipalities to look at before making their decision. “Nobody in Canada has had any experience at all with legal, on-street retail of cannabis,” said Richard Jones, a professional engineer and lawyer, during a presentation to the members of council committee. Jones also pointed out that, in his view, once the decision to opt in is made, the provincial government will take over, leaving the municipality with little say as to how it will be regulated. For others, the idea of having a storefront so members of the community can safely purchase marijuana without worrying about where it comes from just makes sense. Harley Branscome, a retired Toronto stock trader, said it’s a way to cut down the black-market trade. Branscome isn’t alone in his stance. According to polls done by the county, 63 per cent of its residents support tightly regulated storefronts. The Canadian government has also set aside $30 million to assist municipalities with the transition to legal cannabis. Once the decision to opt in is made, the County would receive an initial payment of $34,750, with secondary payments being made of a minimum of $5,000. Some entrepreneurs say this influx of cash is a way the community can capitalize on the legalization, offering new opportunities to bring in people to the county. With the general decision already having been made to opt in, the vote on Jan. 22 will seal the County’s stance on how they will proceed with this new endeavour. KINGSTON, Ont. (12/01/19) — Shappire Nightwind stands with demonstrators at the defend Unist’ot’en gathering in Confederation basin in Kingston on Saturday afternoon. The Wet’suwet’en First Nation in B.C. have been blocking their land from the construction of the TransCanada Coastal GasLink pipeline. Photo by Shelby Lisk. Over 100 individuals gathered at the Confederation Basin Marina in Kingston Saturday to show their solidarity with the Unist’ot’en camp and the Wet’suwet’en First Nation in British Columbia. A remote road in northern B.C. is the site of the Unist’ot’en resistance camp at Talbits Kwah (Gosnell Creek) and Wedzin Kwah (Morice River) to block employees of the Coastal GasLink, a subsidiary of TransCanada Corp., from accessing the worksites to start construction on the TransCanada Coastal GasLink pipeline. The Wet’suwet’en were given 72 hours to remove physical barriers to allow contractors and employees access. A second blockade, called Gidimt’en access point, was set up further along the road. Tensions mounted on Jan. 8 when the RCMP entered the Gidimt’en camp and arrested 14 people for allegedly failing to follow the court injunction to remove the blockade. TransCanada Corp. says it has signed agreements with the elected councils of all 20 First Nations along the pipeline route, however, hereditary chiefs have not given permission for the pipeline construction to begin. Following the heat of the conflict, Prime Minister Justin Trudeau met with the Assembly of First Nations on Jan. 14 to speak about his commitment to reconciliation in Canada. “Canada cannot move forward if Indigenous peoples continue to be held back. Together with Indigenous partners, the government of Canada is working hard to move the dial on reconciliation, and today’s meeting with the AFN was an important step. By having open conversations and taking concrete action, we can make real and lasting change for Indigenous peoples and all Canadians,” said Trudeau in a statement. Protests in solidarity with Unist’ot’en have erupted across the country including two rolling blockades on Ontario’s Hwy. 401 and Hwy. 402 on Friday. Following his words, the group of supporters marched the streets of downtown Kingston, shutting down intersections to hear from passionate speakers about the situation. Pamphlets were circulated to pedestrians as the organizers stopped to chat and inform people about the conflict in BC. The pamphlet holds a message from the Unist’ot’en camp: “There can be no question now that this is an issue of Wet’suwet’en rights and title. We have demonstrated that this fight is about more than a pipeline: it is about the right of Indigenous peoples around the world to exercise free, prior and informed consent”. Krista Flute, one of the organizers, stood in the intersections of Princess and King streets to deliver her message. “This is about consent. Consent of our nations, people and traditional governments, consent of our land, consent of our bodies. Canada does not have our consent. Legally and morally we must stop Canada. 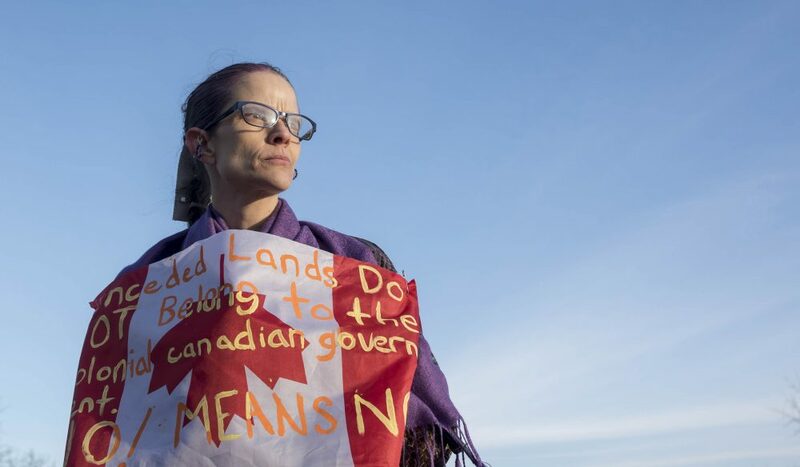 We do not need Canada’s consent to stop and get rid of their invasions,” said Flute as the traffic backed up along the busy road. The group returned to Confederation Basin to end the demonstration with a travelling song. 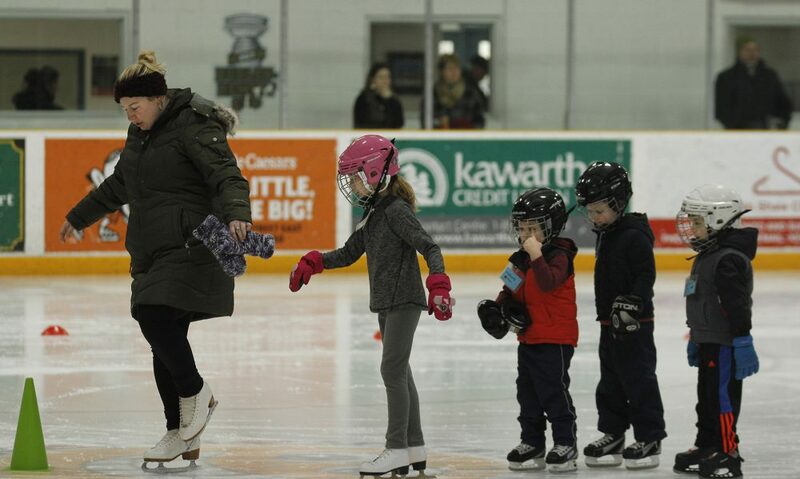 An influential learn-to-skate program that centres on fun, support and basic skill development was hosted by the Trenton Figure Skating Club last Saturday. The event, at the Duncan Memorial Community Gardens Arena, was one of the pre-CanSkate that the figure skating club hosts. Based on Sport Canada’s long-term athlete development principles, CanSkate focuses on physical literacy and the necessary skills needed to take part in any ice sport or to skate as a recreational activity. It is a program that is for beginner skaters from children to adults. There are also options if you wish to just improve your basic skills, whether that be for figure skating, hockey or just skating for fun. Trenton Figure Skating Club has been around since 1957, 62 years, and has been a member of Skate Canada Eastern Ontario just as long. This is the first year that they have had a synchro team. The Bay of Quinte synchro team hold their practices before the CanSkate event and when they are done practising, some of the members stay and assist with the CanSkate. There are 90 participants in CanSkate and they have a star program which has 34. It’s run by National Coaching Certification Program, with trained professional coaches and assisted by trained program assistants. Some of the things you learn in the program are a complete series of balance, control and agility skills taught in six stages of learning that pertain to hockey, ringette, speed skating and figure skating as well as general recreational skating. 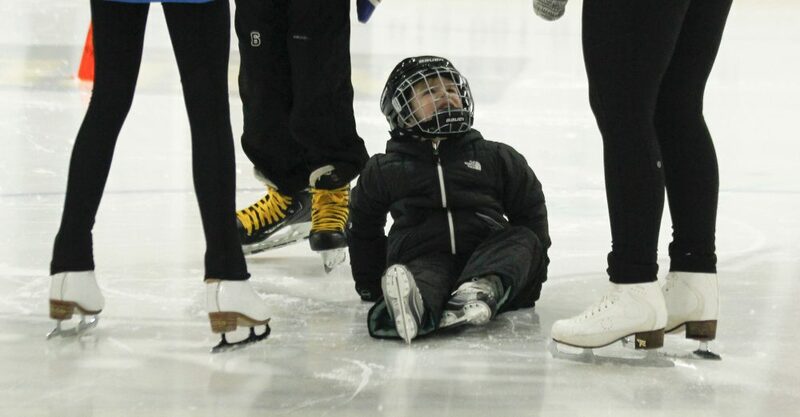 CanSkate uses nationally-tested and proven curriculum and delivery methods that guarantee skater success in developing stronger basic skills and developing them faster, according to the Trenton Figure Skating Club website. If you’re interested in joining the program, some of the things you can expect are action, movement and fun. Lessons are given in a group format with a coach-to-student ratio of a maximum 1:10. Skaters progress at their own rate and coaches make sessions active using teaching aids, upbeat music and a wide variety of activities that create a motivational environment and promote learning. Badges, ribbons and other incentives are used to benchmark skaters’ progress and reward effort and participation, according to the figure skating club’s website. 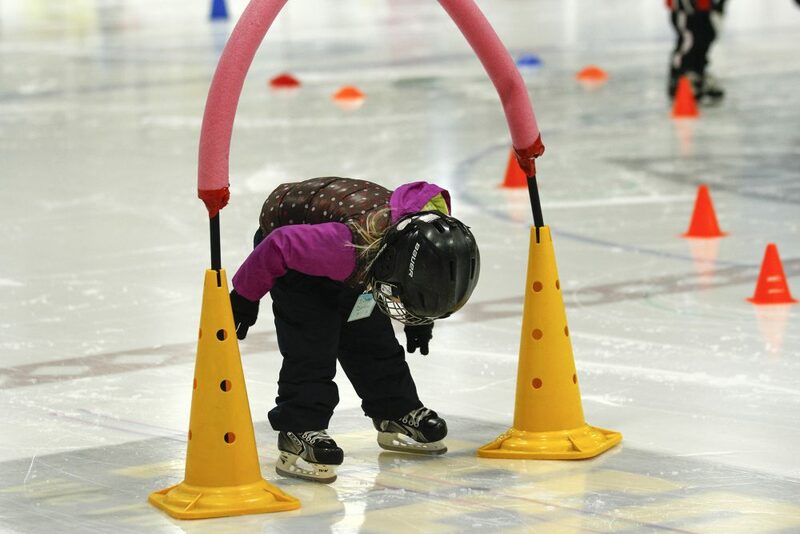 Participants need to have skates, a CSA approved hockey helmet, warm clothes and be ready to learn and have fun. Tyrannosaurus Pets is a home first, then a pet store. Rob Kirk owns the Tyrannosaurus Pets name and he runs the Belleville branch of the store on his own. His wife, Crystal Kirk, runs the slightly bigger Trenton store which also offers grooming services. With an ardent passion for animals and properly taking care of them, the Kirks have been running the stores for over two years. Kirk insists the store is more than an ordinary pet store, and offers exotic pet food, products and various awareness programs. Along with the sales part of the store, he also shows a humane side to his beloved animals. One of those animals is Slimer, a black and white Tegu lizard. “Slimer was dropped off at the store. He was seriously malnourished; you can see ribs and bones protruding. Nobody wanted to go anywhere near him. “We worked with him for around seven months to get him into a healthy state, and probably three more months to make him friendly. He tried to bite everyone, and escape from every enclosure, all the time,” says Kirk. Thanks to Kirk’s attention and care, Slimer is now healthy, friendly and has found a home at Tyrannosaurus Pets. Slimer is not for sale and is a special attraction of the “Wild Zoo” party events the Kirks organize for kids, and elderly care homes. Almost all of the pets in the store are captive bred in Canada, with very few exceptions. Kirk tries to make sure that his exotic pets are non-venomous and could never pose even the smallest of dangers to people. He tries to impart knowledge about animals and proper care of them that he has gained throughout the years, so that people can get better understanding of the creatures, and how to keep them as pets and treat them with respect. “I source them from a couple of distributors that I have, as well as small breeders that I have made contacts with over the years. As much as I can, they are all captive bred. 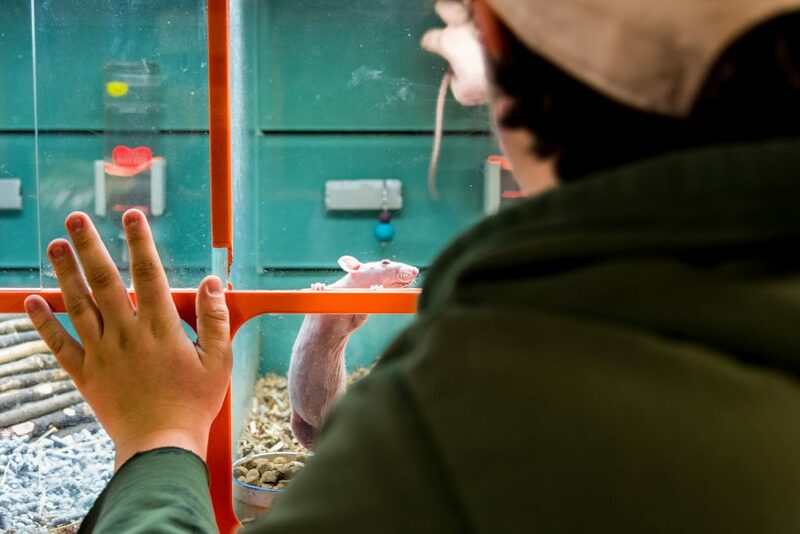 Kirk employs one assistant, Hunter Yarrow, who is a student who works part time at the store and has the responsibility of feeding most of the pets. For the Trenton store, Jennifer Neil assists Crystal Kirk with most of the activities in the store. Neil has been an employee for eight months and is a former employee of Petcetera with over 10 years of experience in the trade. Neil says her favourite pet is Harvey, a 10-year-old ferret, making it the oldest animal in the store. Ferrets generally have an average lifespan of just seven years. In recent years, protests on Ontario university and college campuses have raised questions on what constitutes free speech and hate speech. “Colleges and universities should be places where students engage in open and respectful debate.” said Premier Doug Ford on August 30, 2018 before enacting legislation that demanded Ontario colleges and universities adopt free speech policies in 2019 – or face funding cuts. On January 9, 2019, Loyalist College students and staff were asked one question: “What is the difference between free speech and hate speech?” Their answers were wide-ranging, and proved the question is one that requires deep consideration. 19 01 12 — Downtown Belleville. 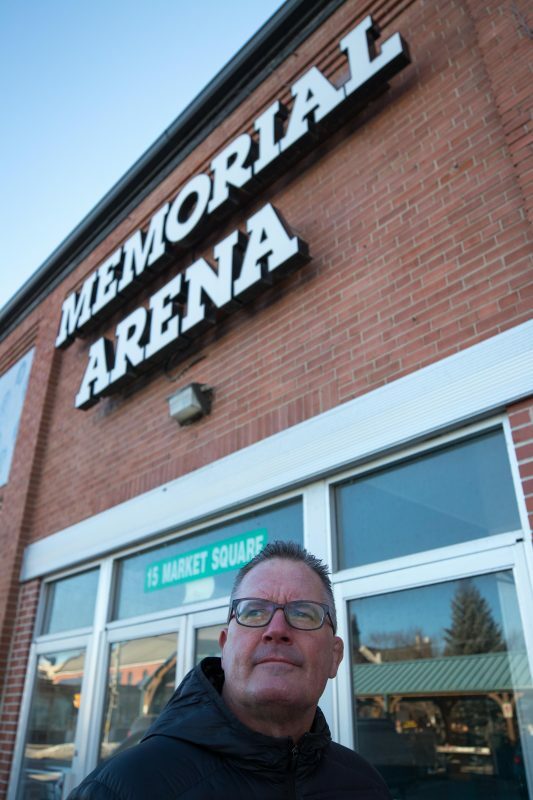 Paul Svoboda stands in front of the old Memorial Arena building. The arena has been closed up since 2010 after failures with the ice equipment inside. The city has been criticized for not doing anything with the historic site since it was closed. In downtown Belleville, there sits an old building close to the hearts of many in the community. That building is the Memorial Arena ice hockey rink. Built in 1929, the downtown arena was home to the 1959 World Champions, The Belleville McFarlands. “Till the day it closed, the Memorial had the best ice in town,” said Paul Svoboda, former sports journalist for the Belleville Intelligencer. Svoboda, like many others in this community, grew up playing on that ice. The Memorial was a heavily utilized spot for junior, minor, senior and church hockey groups throughout its long history. Many have criticized the city for not doing something with the building as part of the Downtown Revitalization program in the last number of years. The City of Belleville spent around $30 million on the downtown renovations, and some think some of that money should have gone towards the Memorial Arena. In the spring of 2018, the building was listed with Ekort Realty for $499,900. According to realtor Joe Shunock, there was plenty of interest in the building. Proposals were made to turn the arena into an outdoor ice rink, a part of the farmers market or an open park area. Shunock warns, however, that despite the price of 500-grand, there may also be high costs in refurbishing the inner workings of the 1920s era building. The proposals and other offers were being discussed by last year’s city council, but with the timing of the 2018 Belleville municipal election, those discussions had to be suspended. Now it’s 2019, and a fresh set of councillors and politicians is in power. Officially, the building is off the market, and the new councillors will look at the Memorial Arena, over 10 years after its doors were closed for the last time. Back in 1920, the city of Belleville purchased the property for the Memorial Arena. Originally, the arena was named the Hume Arena until 1946 where it was renamed in recognition of the local men killed in the First and Second World Wars. The arena seems to have a history of being rejected. According to the Belleville Intelligencer, a 1958 plan of $215,000 to replace the seating, heating system and renovating the entrance was turned down by city council. Years later in 1971, the city also turned down a plan to turn the Memorial Arena into a “community centre” for an estimate $890,000. The only renovations that took place before the 21st century were in 1977, when a $26,000 renovation was made to ensure safety standards were met, and in 1986, $37,000 was spent on the ice making equipment at the facility. In 2005, Barry Bryan Associates completed a feasibility study of the arena and suggested it would cost around $5.7 million to renovate the facility and maintain it as an arena. Five years later in 2010, the arena shut its doors due to equipment failure. BELLEVILLE, Ont. 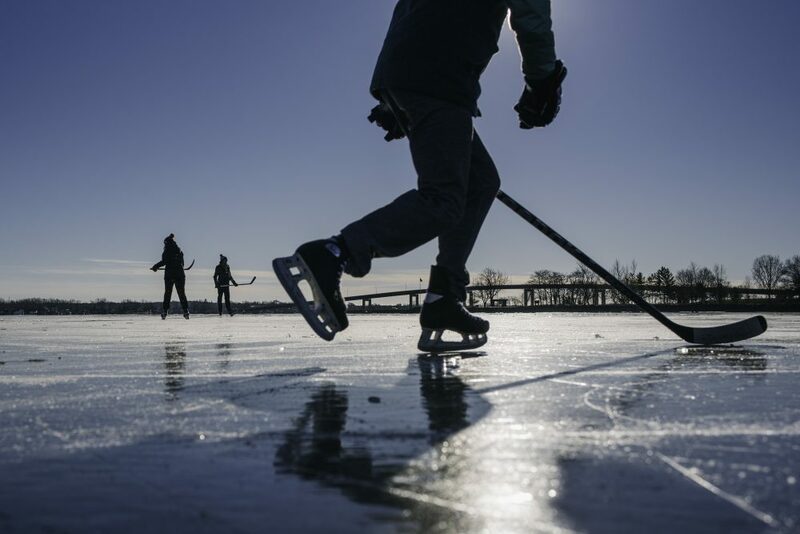 (13/01/19) — A group of friends pass the puck around the ice on Victoria Harbour in Belleville. The cold temperatures have allowed the ice to freeze to safe conditions for skating. City officials say the ice is between 7.5 and 9.5 inches thick and officially took down the warning signs on Friday. The city will continue regular inspections. Photo by Shelby Lisk. The new year is upon us and the Christmas season is behind us, including the ever-festive trees. 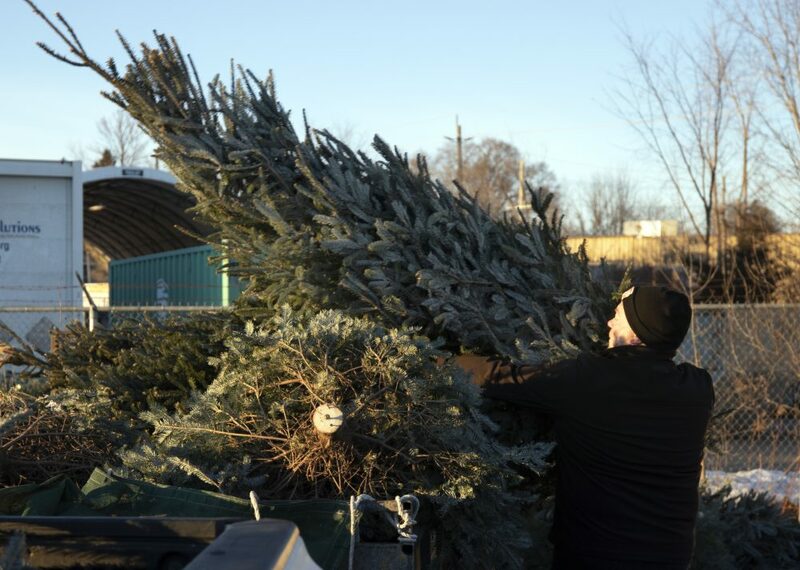 Once again this year, after the holidays, Belleville provided a free Christmas tree pickup as part of its recycling program. According to the City of Belleville website, trees could be picked up on designated date for each street in the city, depending on their geographic area. Starting from Jan. 2, residents east of the Moira River and north of Victoria Avenue had to have their trees placed on the roadside, free of ornaments and tinsel by 8 a.m.
After that, trees were picked up east of the river and south of Victoria Street on Jan. 4, then west of Moira River and then north, then south of the CNR tracks on Jan. 7, then Jan. 9, respectively. But what happens to the trees after they are picked up? Taylor Dall, green co-ordinator for City of Belleville, says after the trees are picked up, depending on when and where, the trailer-mounted wood chipper will come by and grind them up into mulch. Dall says the city has a large pile of mulch that is used for everything from parks to walking trails and flowerbeds to garden fixtures and roadside plant fixtures. This pile is added to with felled trees and shrubbery during other seasons throughout the year. However, there is another lesser known use for Christmas trees. Retired school teacher Eveline Kerr said that she saw a Facebook post from the Sandy Pines Wildlife Centre asking for Christmas trees for their porcupines. “I was just browsing on Facebook and saw this post about porcupines nesting in Christmas trees and I thought ‘What a great idea!’ I should see if the city will give any trees to the wildlife centre, ’ ” Kerr contacted the city of Belleville and they agreed to donate 50 trees to the wildlife centre. Last Saturday, Kerr and her assistant Paul Wiseman loaded the trees into a trailer and took them to the wildlife centre for the porcupines. 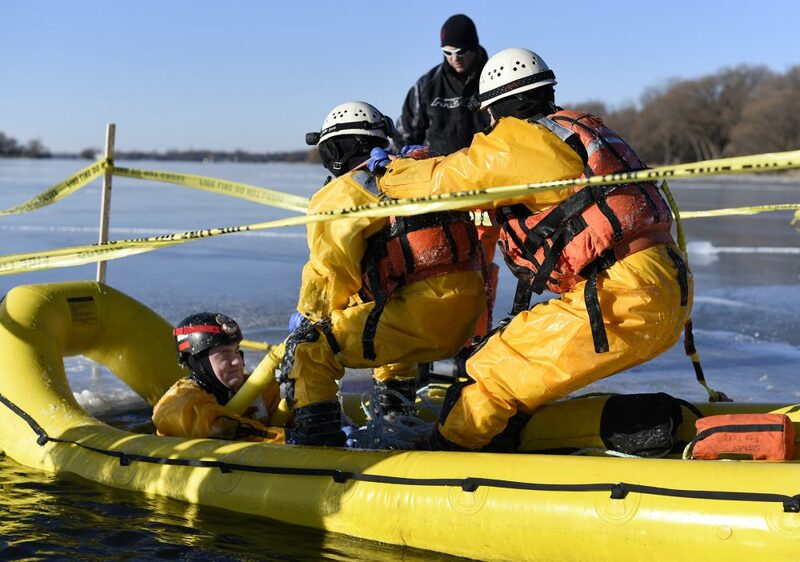 Quinte West Fire Department hosted Ice Water Rescue Training on Jan. 13, starting at 8:45 am. Twelve people participated in the two-hour training session under the direction of two instructors, Perry Holland and Ron Switzer. At least two people are needed to save a person who fallen into icy water. First, one rescuer throws a life ring to the drowning person in the water and after he catches it, they pull the person up onto the surface. After successfully saving the person from the water, they hop on an inflatable rescue boat which is connected by two ropes to the shore. 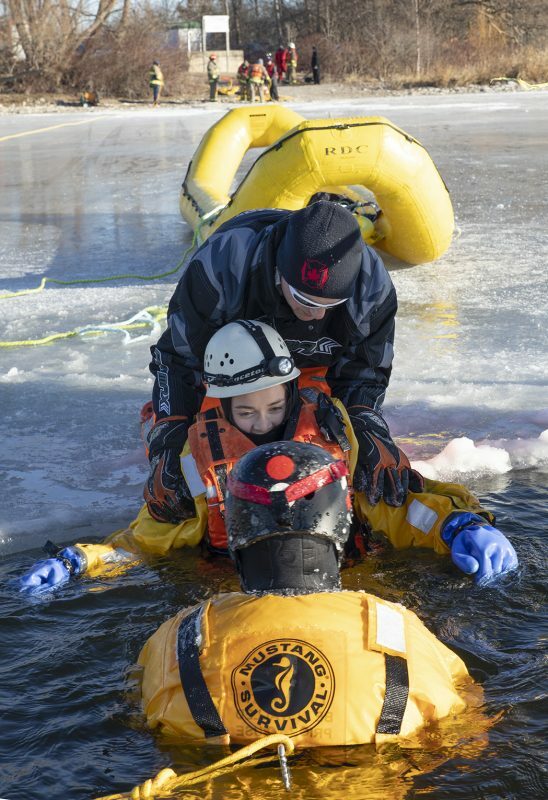 “The purpose of the training, as we do every year, is to train in ice water emergencies in the event one does occur. “We go over different techniques and situations. 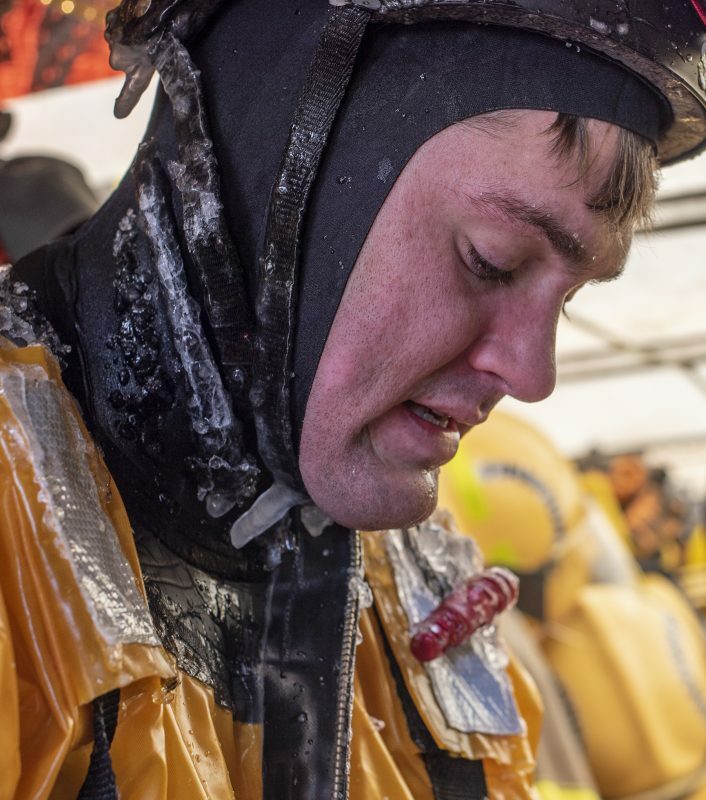 Everyone at the hall does six hours of training in ice water — two hours in class and four hours on the ice,” said Ryan Genereaux, who has been working as a captain at Station 3 for the fire department for 12 years. All of the trainees were wearing protective suits to keep their body temperature up. Deidre Brock, one of the students who participated in the training, said they were all sweating in the suits, even after spending two hours in the ice water. In a real situation, a person who needs to be rescued wouldn’t be wearing one of the suits, and might not even be conscious to catch a life ring or to respond to the rescuers. The students were learning different skills through this training to save local people in various emergency situations. 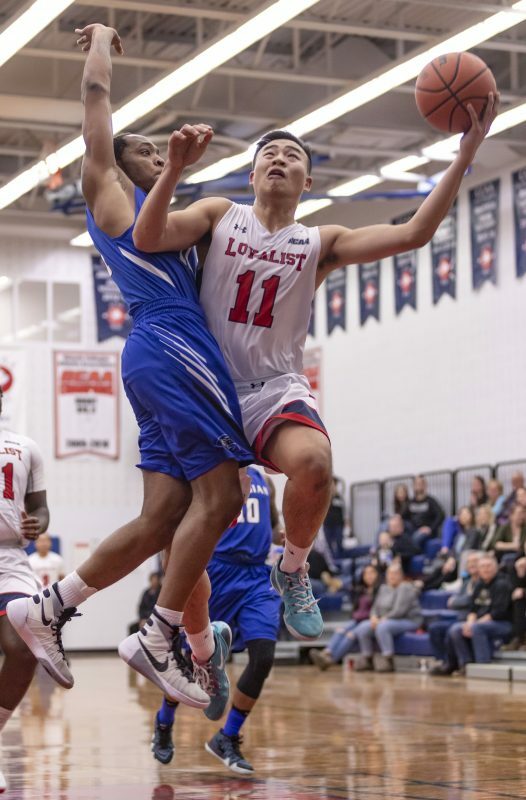 The Loyalist Lancers saw an epic weekend of action as both the men’s and women’s volleyball teams battled it out against the Durham Lords on Friday. The women’s team started off the night with a tough 3-0 loss to the Lords. Although they didn’t take the win, they dominated their defensive line with a 3.0 block average, causing the Lords to make live changes to their playbook. Fourth-year player Jilian Hoftyzer showed her defensive strength with an impressive seven kills and three blocks. 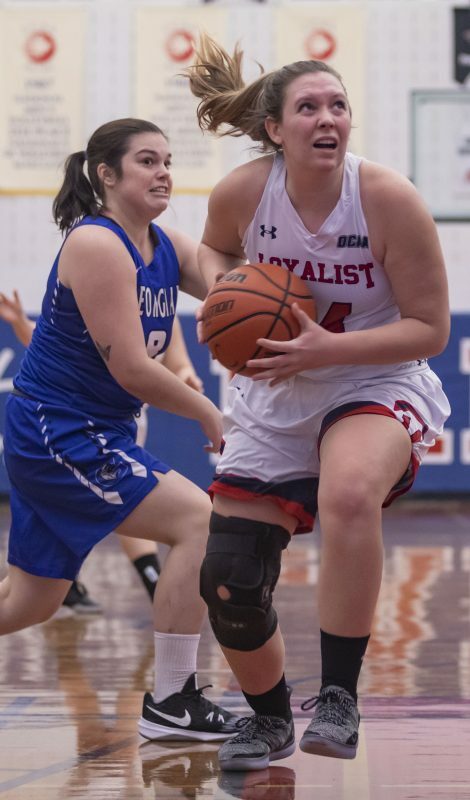 Raven Maracle also stepped up by racking up 15 points for the Lancers, placing her as the top scoring player for the match. The team has lost several key players since the season started, but they aren’t about to let that stop them. “Currently, we are in a playoff position, and our goal is to stay there and work our way up in the standings,” says Hoftyzer, a driving force on the team. 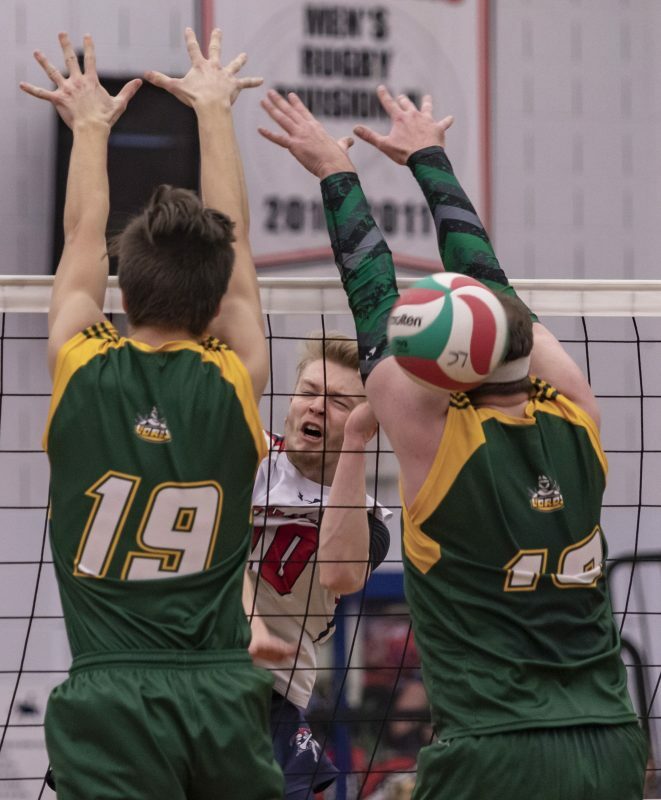 The men’s team saw another intense rally winning a five set match over the Lords 15-12. The game was a battle from start to finish, with a score difference of only a couple points throughout each set. The Lancers lost their first set 25-23, but did not let that get them down they came back to dominate, winning both the second and third set. The Lords, not a team to quit, pushed back and won the fourth set, forcing the Lancers into a fifth round. With Josh Roberts serving, the team was able to secure the victory and take their second win of the year. Both the men’s and women’s teams will be looking to take home a win next weekend as they travel to Ottawa to take on the Algonquin Thunder, as well as the La Cité Coyotes. This entry was posted in Photojournalism Pioneer and tagged Belleville, Loyalist College, loyalist college photojournalism, loyalist lancers, Photojournalism, protest. Bookmark the permalink.